Thank you, families for a spectacular first year at Horizons! I have felt so welcomed and valued. Every moment with the 3/4s has brought me joy and I have learned so much from them and with them! You have been so generous with your gift of words, cards, hugs, flowers, and tokens of appreciation and I am deeply grateful. During Fun Day yesterday, we saw the best in each other. There was a delightful playfulness in how we interacted with one another. Each student pushed another to be his or her best self. It felt safe to take risks and try something new (or participate in a game we don't usually like doing). Our successes were noticed and celebrated by all. Strategies and suggestions were shared gently for improvement. Encouragement and cheerleading came naturally as did grace and courteousness. Resilience was shown when rain, heat, and time limited and warped the original plan. And while academic growth is also important (don't forget to read lots this summer! ), it was wonderful to see this growth in character and community as we wrap up the year together. Our performance is coming together! This is a very exciting time for the 3/4 classes. The students continue to work hard each day. We spend an hour in dance with Kirsten, and an hour rehearsing our play and making props with homeroom teachers and Dorinda. You will love our version of The Sneetches! 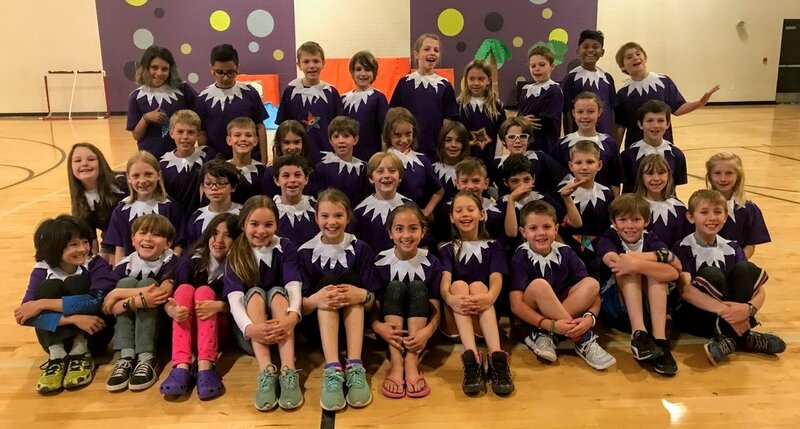 Cast A (Emmy and Adam's classes) performs for the school on Tuesday, May 23, at 8:45. The parent performance for Cast A is Wednesday evening, May 24, at 5:30. Cast A students need to arrive in homerooms at 5:00 on Wednesday evening. Cast B performs for the school on Wednesday, May 24, at 8:45. The parent performance for Cast b is Wednesday evening, May 24, at 7:00. Cast A students need to arrive in homerooms at 6:30 on Wednesday evening. We are asking that all students bring a pair of black pants for their costumes. The rest of the costume is being provided at school. All students must have a pair of black pants (long, not shorts) at school on Monday, May 22. Please be sure the pants are labeled with your child’s name. Black pants on Monday! Students should bring an empty backpack or reusable grocery bag to school with them each day next week, from Monday-Thursday. Throughout next week we will be sending home artwork, folders, composition books, finished work, and other odds and ends that students accumulate at school over the course of the year. We will have everything sent home by the end of the day on Thursday. On Friday we ask that students only bring snack in disposable containers. We have found with the excitement of the end of the year it is difficult to keep track of belongings on Friday. Thus, we will send everything home by Thursday and we ask that students bring in nothing but a loose snack on Friday. The students will be bringing home the entire year’s worth of work next week. We encourage families to set aside some time in the first few weeks of summer break to go over the work. Conference times always seem rushed. This is your opportunity to take a look more thoroughly at everything we explored this year. Have fun! When not dancing or rehearsing for our play, we are still busy working! We are taking time to polish strategies for the four operations in math. In writing we are learning to give and respond to feedback to support the editing and revising process with letter writing. In reading we are working to explore different genres. All of the 3/4 classes will be walking to Glacier Ice Cream on Thursday afternoon, May 25. This will take the place of a typical cast party. It is a wonderful end of the year celebration. Students do not need to bring money. Classes are practicing grace and courtesy lessons to get ready for this big event. We will walk over to Glacier one class at a time, allow each student to order one ice cream/gelato/sorbet, we will pay as a group, and enjoy our treats on our walk back to school. This is an annual favorite for our students. Fun Day has been rescheduled for Thursday, May 25, from 9:50-11:50. Students should be prepared for lots of outdoor time and water play on this day. Sunscreen, sun hats, sneakers, and appropriate attire will help make the day fun. Due to snow and cold, the mini-marathon has been cancelled this year. We’ll try again next year! Our last day of school is Friday, May 26. Dismissal and the school picnic are scheduled for 12:00. In the first part of the day we will have homeroom time, there will be an all school assembly, and we will work together to clean classrooms. To mark the end of our amazing year, we will have a Gift of Words celebration in each homeroom. All of the children have been busy crafting thoughtful personal letters to one another. From 11:00-12:00 on the last day, students will present these letters one at a time in a way that honors, recognizes, and celebrates each student. Parents are invited to join us for this very special time. Fun Day is a Horizons version of a Field Day often held at other schools. The seventh grade students plan and host Fun Day games for the students in K-6. We will stay together as a class community as we go from one fun game to the next! Sunscreen and hats are a must if this turns out to be a hot and sunny day. This is a wonderful annual school tradition. Another favorite end of the year event is our school mini-marathon. This started many, many years ago as a way to help students get ready for the Bolder Boulder. Students will gather after the last recess at 2:20 for a group stretch and the start of our “race.” All students K-8 participate in the loop around the pond. Adults are stationed all along the way as well as with the waves of students. Transition Day is the time when students moving up to a new grade level team next year get to visit the next level classes. This is coordinated school wide so that students will get exposure to what next year’s classes may feel like. On a ten minute rotating schedule, K students will visit the four 1/2 classes, second graders will visit the four 3/4 classes, fourth graders will visit the four 5/6 classes, and sixth graders will visit with the seventh graders. Our hope is that this will both help to calm nerves about class changes next year as well as get students excited to rise to the next grade level. Hosting students (grades 1, 3, 5, and 7) will feel like the class leaders as they welcome the incoming students. This event will coincide with the eighth grade retreat. We will also have some special events planned for the last day of school. On our last day, Friday, May 26, we will have a special assembly, a school picnic, and graduation. Please note that dismissal is at 12:00 on this day. Dream Homework projects are due this coming Monday, May 8. Students have had ongoing support and reminders for this process at school. We hope that things have been moving along as scheduled at home. Please let us know if anything is needed at this time. All finished work should arrive at school no later than Monday, May 8. We will find places to display this amazing work in the classrooms. Students will be formally presenting their work to their classmates during the week next week. In class today we reviewed the oral presentation rubric that we will be using with the students. Students took copies of the rubric home to use as a reference when planning their presentations. Presentations will begin at 12:30 each day. Parents are invited to join us for their child’s presentation. Students from all of the 3/4 classes will have their work on display and will be available to discuss their projects with the community on Thursday, May 11. We will be set up in the cafeteria from 2:30-3:30 on that day. We would love for families to be able to join us for this fabulous experience. It is quite something to see the “dream” work of 80 young people. We are busy getting ready for our big show -- The Sneetches! The next three weeks will be busy with preparations, dancing, and rehearsals. Students in Adam’s class and Emmy’s class are in cast A, and students in Kate’s class and Julie’s are in cast B. Both casts are getting the same opportunity each day. We split into two casts so that our numbers are workable to give the students the best experience possible. We have found our rehearsal time to be rich with instruction and experience in the performing arts. In our rehearsal times the students rotate through many stations: a 45 minute dance class, a 30 minute scene time with acting and singing, practice stations, and working on props and sets. Thanks so much for your generous donations to make this possible for our 3/4 students. We can’t wait to perform for you in a few weeks! Cast A (Adam and Emmy) will have their dress rehearsal/performance for the school community on the morning of Tuesday, May 23, at 8:45. Cast A will have their evening performance for parents on Wednesday, May 24 at 5:30 pm. Students will need to arrive at 5:00 for this show. Cast B (Julie and Kate) will have their dress rehearsal/performance for the school community on the morning of Wednesday, May 24, at 8:45. Cast B will have their evening performance for parents on Wednesday, May 24 at 7:00 pm. Students will need to arrive at 6:30 for this show. Although we are busy with rehearsals until 11:00 most mornings, we still have plenty of time each day for instruction and work time. We have big goals for the last few weeks of school! In math we are still planning on working with measurement, graphs, decimals, and a revisit of the four operations. Our work in reading will include more exploration of poetry, setting, and vocabulary. Finally, in writing will be working on editing, revising, and publishing, persuasive essays, letter writing, and end of the year reflections. We will send the kids home tired at the end of the month! We are taking time in the next couple of weeks for our end of year assessments. This week all of the students in the 3/4 classes are taking the i-Ready reading assessment. We will also be giving both a written and an oral math screener to all of the students. We so appreciate families taking the time to meet with us during our scheduled conference days. Please take a moment to fill out the conference feedback survey. Your feedback is critical for us to plan conferences that are meaningful and valuable to you. The survey information comes back to the teachers in an anonymous form, although you are always welcome to personalize your sharing if that feels more useful. We have begun the final eight weeks of the school year. It has gone by amazingly fast, hasn’t it? We will be as busy as ever during the next two months. Most of the classes have completed their studies of ancient civilizations, although there may be a few loose ends to explore a bit further and tie up as possible. Our reading focus for the next couple of weeks will be on short stories. Short story is a terrific genre for this age as it allows us to explore all of the elements of prose fiction in a story that can be read in one sitting. With short stories we can dive deep. We can do multiple readings of a story, we can annotate the text, and we can explore close reading in a supported and successful way. Since we have just completed an extended unit in writing nonfiction pieces, we will revisit narrative writing and further explore the writer’s craft. We will continue to build our skills of editing and revising with these new pieces of writing. Math will vary a bit class to class. Decimals, geometry, and measurement are the next units, although each class may be working with them in a different order. Students in Emmy’s class and Julie’s class are going ice skating for the last time this Friday, March 17. Students must have returned the signed permission form to be eligible to go on the trip. We are collecting field trip forms and $9.00 for our trip to the Denver Museum of Nature and Science. This trip will allow us to further understand our studies of both the solar system and ancient civilizations. In addition to visiting the Egypt room, we will be able to tour the special Viking exhibit, and see the Destination Solar System show at the Planetarium. These fabulous programs require extra fees, which is why we are asking parents to donate $9.00 to help cover the cost per student. Parents are welcome to join us and we love having support on this trip, but we will ask chaperones to cover their own costs. Please take the time to read through the conference information for parents before attending conferences. This week we will be doing conference preparation in our classes. The students will be looking through their work from this past year, working together with teachers as well as self-reflecting on their progress, and any goals they may have. Conferences occur the following week, from Wednesday to Friday. Please make sure to double check your conference time and confirm with your child’s teacher, and be sure to give them any input that you feel is needed prior to the conference. PARCC testing continues this week as well as after spring break. Please see earlier updates for dates and details regarding testing. As a reminder, PARCC testing begins next week. If you are planning for your child to participate, they will need to bring a set of earbuds/headphones each day that they are testing. The testing schedule will require changes in our typical daily routines. Morning recess will, most likely, be later than usual. We encourage students to have a snack that they can grab on the go as needed. If students are not feeling well or are sick and need to miss a test, make up tests will be scheduled. The students in the 3/4 classes have been so busy learning, making meaning, working hard, and having fun together. Social studies has been a significant part of our studies lately. As you may have heard, our classes are mummifying a chicken. Really! Ask your children to show you this the next time you have a free moment at school. We are in the editing, revising, and publishing phase of our ancient civilization work. This is where social studies becomes integrated with our literacy instruction. Students began by asking questions and taking notes. While studying ancient civilizations we also learned about writing informational paragraphs. Next, students learned different strategies for planning their writing. They were able to write a series of rough drafts of their ancient civilization paragraphs. Editing was the next step. Now we are working on the final steps of revising and publishing. Sharing these will be a highlight at conferences. Over the next month classes will be concluding their studies of fractions. The next steps in math are transitioning from fractions into decimals, returning to long division, and doing a kind of math “boot camp” to reactivate skills learned earlier in the year. Thank you for all the delicious food at our fraction feast last week! This is quickly becoming a favorite annual tradition for the students. We are very excited to have introduced our first current event homework assignment of the year. The homework assignment can be found at bit.ly/horizonscurrentevent . Homeroom teachers introduced the assignment in class. Students were given a chance to visit the site, make a copy of the assignment sheet, and save it to their Google Drive. Students looked at the assignment and discussed expectations. Please note that we also provided hyperlinks to a handful of safe, kid-friendly news sites. Helping students to become aware of current news and be able to discuss issues with friends and family feels like such a valuable practice. Standardized testing season is upon us! Please note our schedule before spring break as listed in the above calendar of events. Although it is not yet finalized, we expect that two of the 3/4 teachers will proctor the tests (one with third graders and one with fourth graders), and two of the 3/4 teachers will work with students who have opted out of the tests. Students who opt out will not receive new instruction, but will be in a quiet environment with an opportunity to work independently. Our next field trip will be on Tuesday, March 21. We are heading to the Denver Museum of Nature and Science. While at the museum we will have an opportunity to visit the temporary Viking exhibit (one of the ancient civilizations we have been studying), view a film at the planetarium (to connect with our beginning of the year space studies), and explore the Egypt room (another of our ancient civilizations). Please watch for a permission slip coming home soon. Parent chaperones are always invited and welcome, although we will ask parents to pay for their own fees to help keep our costs down. Those interested parents can please let their homeroom teachers know. Please take a few moments to read the 3/4 conference information for parents before arriving at your child’s conference. The students have finished their first couple weeks of the music themed Arts and Science session. We were excited to be able to offer seven music based classes for the students to choose from including: Guitar, Choir, Drums, Sing and Play, Handbells to Harmonica, Musical Theatre, and Ukulele. The sounds of musical learning are filling the halls at Horizons for the last hour of the day! Be sure to ask the students about their music class if they have not already been talking about it at home. Everyone is invited to the Arts and Science Sharing on Thursday, March 9, at 2:20. We expect all of the classes to perform. Families will soon be able to order products made from their children’s artwork. This is a fundraising effort at school through a local company called KidzArtwork. Once art pieces are chosen they need to be carefully and properly prepared at school. We are looking for a few volunteers from each class to work with Kara on this great project. Please let your child’s homeroom teacher know as soon as possible if you are able to help with this program. Thanks! We made the best of our situation on Friday when the bus was a no-show for our trip ice skating. Instead, we headed to the pond for popsicles and an exercise course. We played games, laughed often, and got some exercise. And while it wasn't ice skating, we concluded that our time together was still pretty great. Thanks, too, to the parent chaperones who helped turn our situation around. Our ice skating buses are confirmed for next Friday and March 10. I will be in touch shortly with a make-up date for our missed ice skating session. In the mean time, enjoy the long weekend! We’ve settled nicely into the second semester and we’re hard at work in many subject areas. Our literacy blocks are integrated with social studies right now as we continue comparative research of ancient civilizations. Together we have defined civilization and students work in pairs to research the components of a civilization (language, architecture, culture, economics, jobs, government, religion, and more) as well as researching and creating a timeline of their civilization’s rise, fall, and golden age. We are reading and thinking deeply about nonfiction texts and have participated in rich conversation about reliable sources and what to do with conflicting information. During writer’s workshop, students have been diligently writing expository, persuasive, and narrative paragraphs. We have studied the simple 5-sentence paragraph as well as the more complex 8-sentence paragraph. We are working our way through the steps of writing - practicing planning ahead of writing and the revision and editing process before publishing. As we wrap up our social studies research, we will write and publish paragraphs on our civilizations. We’ve launched our work in fractions during math. We’ve spent significant time creating our own fraction strips, comparing fractions, and working with equivalence. We have also begun work on mixed numbers and improper fractions and will continue our study with adding and subtracting numbers with like denominators and multiplication by a whole number. Students were assigned a recipe alteration and fraction feast homework for the next couple weeks. This is a chance to support your child in understanding and using fractions through the real-world experience of cooking. Their fraction strips will be sent home to support in visualizing and manipulating the equations. All students are expected to complete the math portion of the assignment. However, bringing in you cooked meal for a fraction feast is completely optional. We will have our fraction feast on Friday, February 24th and homework is due at this time. Please reach out if you have any questions. We’ve enjoyed three weeks of tennis with Gonzo and we are celebrating significant improvement in racket control. The programming has been high quality and we’ve laughed throughout our practices. Next Friday, February 17 we begin three weeks of ice skating. Students should wear pants, socks, a sweatshirt/jacket, and gloves for ice skating and they need to bring a helmet. We will rent ice skates from the rink so please help your child remember his/her shoe size (students can also bring ice skates from home). Due to regional skating competitions at the the rink, there is a change in the dates for ice skating. We will be ice skating on February 17, February 24, and March 10. We will be out of the building from 9:30 to 11:30 each Friday. If you are interested and available to chaperone for ice skating, please send an email with the dates you can join us. FInally, there is an additional waiver that needs to be signed for each child. Please go to this website and fill out the waiver for your child before our first skating day. As a ¾ team, we have made the decision to keep our Valentine’s day celebrations to a minimum. We will write some poetry in the classroom and celebrate the relationships we have with one another through verbal appreciations. If your child wants to bring in cards or tokens of gratitude, make sure each child in the class is recognized. Cards will be passed out at the end of the day and is completely optional. As mentioned in an earlier message, conferences will be held before spring break. Conference scheduling will take place at the end of February and we will send out specific dates and times for each family afterwards. We work hard to accommodate your preferred times requests. As always, thanks for your continuous support of your child and what we do at Horizons. We look forward to sharing all of our hard work and progress at conferences. Please reach out if you have any questions. We’re off to a great start to second semester! I hope your child has been sharing about all the learning we’ve begun including fractions, geography and map skills, small-group book clubs, word work/spelling patterns, and grammar. We’ve also been busy in computer lab and art. I hope you have a chance to peek at our charcoal drawings and winter collages hanging in the classroom and in the hall. This week, we’ll be focusing more on fractions and bookclubs as well as introducing non-fiction paragraph writing and comparative research on ancient civilizations to prepare for our own ancient civilization research in the coming weeks. There has been a sense of calm concentration in the classroom as we get back into the school grove. Our quality of work and on-task work habits are really strong right now - we’re craving to learn and working hard at it! Winter sports starts this week for 3/4. Our class will have tennis on Tuesdays for the next three weeks. Please remind your child to wear tennis shoes and clothing for movement on Tuesdays. Students can bring their own tennis racket from home or use ones provided by the coach. We will be ice skating on February 17, 24, and March 3. We will leave school at 9:30am and return by 11:30. If you are interested in volunteering, please let me know! Again, students can bring their own ice skates or can rent from the ice rink. On conference days we do not have classes scheduled. Instead we meet with families and their children for 40-60 minutes each. For those families with more than one child at Horizons, we work hard to schedule conferences back to back unless you direct us otherwise. It helps if families can give us 3 possibilities to take to our scheduling conversation on Friday. Many thanks in advance for emailing preferences by noon on Friday. More to come shortly. And as usual, please don’t hesitate to contact me with any questions, concerns, or celebrations. I value the communication! We had such a joyful last day of the semester together filled with laughter, giving, and community. Thanks to all of you for helping our secret snowflake experience be successful. Check out the photo tab to see pictures from our trip to Share-A-Gift - what a profound experience for all of us to see the work they do there and to lend a helping hand. Many kids shared about how the experience opened their hearts to recognize just how fortunate we are; “it felt incredible to make a difference for other kids in need,” one student commented. I am deeply appreciative of the many cards and gifts I too received today from families. Thank you for your generosity and never-ending support of me, your child, and Horizons. I hope you have a chance to laugh and rest this holiday season. I look forward to our return to school on January 4th. Book Talk homework is due on Monday (as is a parent signature in planners). I have received many Google Slide presentations and I am quite please with how they have turned out so far! Thank you for the support you provided to your child in creating a high-quality presentation. I look forward to the presentations this week! Homework for this coming week will be centered around secret snowflakes. On Friday, your child was given a secret snowflake and a notecard describing the interests and likes of that child. We talked in class about how this information can serve as ideas for writing poetry and notes, drawing pictures, and giving small home-made gifts to their snowflakes all week. Please support your child in writing poetry, notes, jokes, riddles, etc. to share with their snowflake each day this week. On Friday, we will have a snowflake reveal celebration and this is the only day a gift that costs money is allowed. Your child should bring this final gift to school by Wednesday. It should be wrapped, include the recipient's name, cost a maximum of $7, and be an item that can be used in school (erasers, pencils, fidget toy, small ball for recess, pens, notebooks, etc.). Please let me know if you have questions. Thursday is our field trip to Share-A-Gift. We will be leaving school by car around 10:45 and returning by 12:15, just in time for lunch. If your family is able to donate a new or gently used toy to the Share-A-Gift donation box at the front of the school, we will be delivering these donations to Share-A-Gift when we go. Again, thank you for your support. There are a few new pictures under the photo tab to check out! It has been such a joy getting to know all of your children this semester. I have been warmly welcomed into the Horizons community once again and I give gratitude every day for the work I get to do with your kids. We’ve been working and playing hard and I’ve enjoyed every minute of it. I hope you all have a wonderful holiday season, hopefully with a moment to rest and be with family. Curriculum Update: There are only a few weeks of school left until winter break and 2017! We will be quite busy in the classrooms until the end of the semester. The 3/4 teachers meet together weekly to plan curriculum, take care of business items, plan and arrange special programs, and discuss student progress. Although each class functions in a unique way per the students and teachers in each room, we try to stay aligned with curriculum. Our current work in reading includes finishing book clubs and moving into a study of poetry. Students will be learning about reading and analyzing poems, the features of poems, different types of poems, and will take time to read poetry every day. The work in writing has two components at this time. We are exploring word study work. This includes daily instruction on topics including homonyms, synonyms, and antonyms. We are also taking time to learn to write poetry. The experience in reading poetry directly guides the work we do in writing poetry. Students will try writing the features they learn about as readers. In math we are working on division. This is the last operation for us to explore in the fall semester. Just as we did with the other three operations (addition, subtraction, and multiplication) we will work to develop a solid understanding of the operation. Students will be able to define division in a very concrete way. They will practice their fluency with the facts. They will learn a variety of strategies for solving division problems. We will also work with long division. What an exciting time! Science rotations will be completed at the end of next week. In this eight week program students had the opportunity to study the solar system and the sun, moon and Earth system with Julie and Rachel, the timeline and formation of the universe as well as paleontology with Adam, rocks and minerals with Kate, and Earth structures with Emmy. It has been a time of rich learning. The students have had the opportunity to work independently, to work with partners, and to collaborate in small groups. They have watched videos, done research, and worked with hands-on materials. We hope that you have been hearing a lot about Earth and space science over the past few months. We are all eager to begin our study of ancient civilizations when we return in January. Including/Excluding: There is so much opportunity for social/emotional teaching and learning at school. Although many things come up spontaneously, some we can expect and prepare for in the classroom. One such thing that comes up every year at school for our students is the issue of including and excluding. The expectation that we reinforce at our level is that school is a time for including others. We practice and model scenarios for the children and offer them the language they may need in a variety of situations. Our hope is that the answer to, “Can I play with you?” or, “Can I join you?” is an inclusive, “Yes!” We also remind the students that school is not a great place for one-on-one time with a friend and we encourage play dates during afternoons or weekends for this. Please let us know if you have any questions or concerns about including and excluding at school. Snacks: We take a snack break every day between 9:45-11:00 (some classes take their break before recess and some after recess, depending on schedules). Since snack time overlaps with instructional time, our hope is that students have a quick, easy, and healthy snack available to them. Our recommendation is that students have an idea of what to eat for a snack and what to eat for lunch. Some families choose to pack the snack in a separate bag or in separate containers. It is easiest for us at school if students just get out their snack rather than their whole lunch. By doing it this way we can more easily encourage the children to just eat a snack and the set up and clean up is simplified. We also encourage families to pack healthy snacks (think food, not product) such as whole or sliced fruit, vegetables, whole grain crackers, hard boiled eggs, beans, cheese, yogurt, or lunch meat. Please let us know if you have any questions about our snack time at school. The school no longer provides snacks for hungry students. Moon Journals: We have finished our moon journal homework and our required daily moon observations. We do hope that you enjoyed supporting your children in taking a pause each day to find the moon, to stop, and to wonder. Moon Journals were due completed and in class on Monday, Novemeber 28. Our closure with this homework project will be to add a study of the phases of the moon to our science work in the next week. In looking over the work that has been turned in to us by the students, we have noticed that some students took great time and care with their homework, and others rushed through their work or missed many days of the observation and record keeping process. We ask that when we do give homework that it is always done to each student’s best ability and highest quality work. Please let us know if you have any questions about homework and homework expectations at the 3/4 level. Homework: Homework at the 3/4 level will be on and off, as appropriate, throughout the year. Some of the homework will be project based, some will support learning in reading, writing, or math, and some of the work will connect with student learning in science or social studies. Reading for a minimum of 2 ½ hours each week is always assigned. We do expect that homework should be completed to each student’s best ability and turned in on time. Homework will be similar through all of the 3/4 classes, although will not always be the same. With a break approaching, we know that students will have extra time for reading. Therefore, homework for next week will be preparing book talks. Expectations for this will be defined more clearly in homerooms as this is assigned. Share-A-Gift: The 3/4 classes will be working with the Share-A-Gift program in December. Students will set up collection boxes in the front hall of the school. On Thursday, December 15, all of the classes will go to the Share-A-Gift location to help sort and package toys. We will need parent drivers for this outing. Please talk to your child’s homeroom teacher if you are able to drive (to an empty retail location in Boulder) a group of students and volunteer with us. The trip will take approximately 1 ½ hours for parent volunteers. We have four shifts that each last one hour. Adam’s class works from 9:00-10:00, Kate’s class works from10:00-11:00, Emmy’s class works from 11:00-12:00, and Julie’s class works from 12:00-1:00. The following information about Share-A-Gift is from their website: Share–A–Gift is an all-volunteer, secular annual holiday project that provides toys, books, and bicycles for children of low-income families in the area of Colorado’s Boulder Valley School District. Share–A–Gift is a 501(c)(3) under IRS rules and has operated as a non-profit, all-volunteer organization since 1972. Each year, Share–A–Gift helps connect over 600 families representing over 1500 girls and boys, birth to age 14, with community donations. Share–A–Gift collects toys at sites around the city of Boulder and in areas of eastern Boulder County starting Thanksgiving week through the middle of December. Volunteers set up and organize a “Toy Shop” in a donated warehouse space where toys are distributed to families-in-need. On a single day, all eligible parents are able to come and “shop” – selecting toys for their children with the help of 100s of volunteer assistants. To be successful each holiday season, Share–A–Gift needs thousands of new and gently-used toys, books, games, puzzles, and bikes for infants, children and adolescents up to age 14. Share–A–Gift allows Boulder families and children the opportunity to meaningfully participate in gift-sharing by donating new or gently-used toys, books, and bikes with families who will appreciate getting these gifts. Secret Snowflake: We will be doing Secret Snowflakes during the last week of school before Winter Break. We will prepare for this week by having the students write about themselves on index cards. On Friday, December 9, students will pick a name and receive the card with information about that person. We will be encouraging the students not to talk about who they have and to try to keep the surprise for the week. From Monday, December 12 – Friday, December 16, the students will be offering a token, a small gift, or a note each day. Students can bring a bigger gift for our celebration on Friday, December 16. The Friday gift should be wrapped and in school by Wednesday, December 14, addressed to the recipient. The “from” information should be left blank. We are requesting that students not bring food or candy as gifts. All gifts should be something that can be used by the students in the classroom. Homemade gifts, cards, and notes are personal and meaningful. The information on the index cards should help guide the students about the person they are gifting. The monetary limit on gifts for the week is $5.00-$7.00. I am so proud of your children for all of the hard work they put into conferences and goal setting over the last couple of weeks. Tomorrow during lunch, the 3/4 classes will be celebrating by making our Pizza Party homework come to life! Pizza will be ordered from Abo's, with enough for each child to have two slices. Gluten/dairy free options will be provided for those with dietary restrictions. Please feel free to pack healthy sides for your child, as well as a morning snack, but know that lunch is on us. It was wonderful to see you all last week. Thank you for all of your support! Additionally, kiddos will be bringing home a goals sheet. This document will live in homework binders, where it is accessible both at home and at school. Throughout the year, we will check in about the goals we set, discussing growth and making new goals when appropriate. Please take a moment to read over the goals with your child to ensure that they reflect your hopes and dreams for your child’s year at school and the conversations we had at conferences. Please let me know and/or write directly on the goal sheet if any changes are requested. Many students are forgetting to show their homework notebook to parents and getting a parent signature on a weekly basis. We decided as a group that we will strive to get a parent signature from every family this week! Reviewing goals is a great time to sit down and review the homework notebook, too. Finally, I am sadden to share with you the departure of our beloved para Hadleigh. She is choosing to spend this time focusing on her health and has been unable to join us at school. We are in the process of hiring a new para and are optimistic about a candidate for the position. I will let you know further information as it is shared with me. We have talked as a class about our feelings regarding Hadleigh’s absence and I ask that you continue to support your students at home with the topic if needed. Again, it was wonderful to spend time with individual families this past week. Thank you for taking time out of your busy work lives to join your child and me at school. It’s a powerful experience for students and truly makes a difference in their lives to have support from families. The outdoor education week of 2016 is officially behind us! We had perfect weather this year to help make it an absolutely wonderful week. 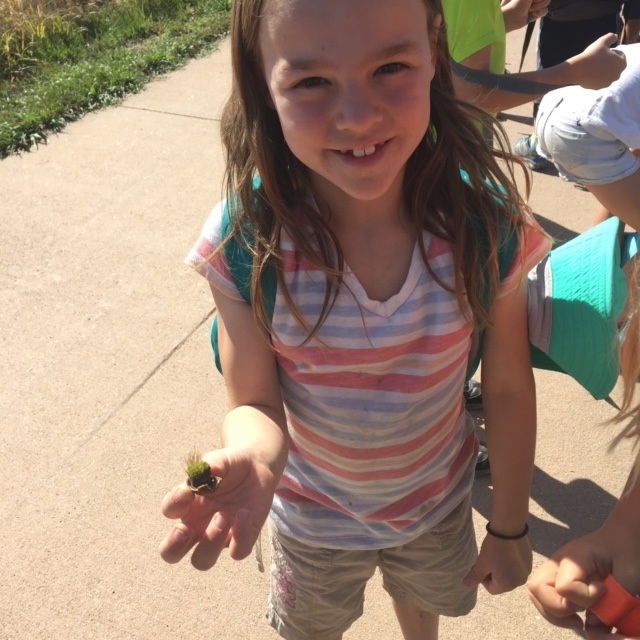 Our trip to Dinosaur Ridge on Monday launched the experience. There’s nothing quite like sitting in a dinosaur footprint to connect students with the past! We were able to learn about fossils and the Earth’s history in a most authentic way. Students also had the opportunity to open geodes. This work connects directly to the rocks and mineral studies we will be doing in science rotations after conferences. The overnight trip to Camp Timberline in Estes Park was a tremendous success. It is a quick overnight trip but we were able to make every moment count. The students participated in six rotations over the two days which included a low ropes course, a high ropes course, “The Silencer,” “The Gut Check,” a zipline, and the single leap. These different rotations all served to bring the groups together in a connected and supportive community, to let students be honest with their strengths and concerns, and to foster huge growth. The setting of the mountains only added to the already awe inspiring work. When we add sleeping in cabins, eating meals family style in a large dining room, and s’mores at a campfire we complete a picture perfect trip! We know that students face many different challenges along the way in a trip like this. For some students the physical challenges (i.e. a fear of heights) are the biggest hurdle. For others it may be eating new foods, sleeping away from home, or spending so much time outside. What we found is that every student found success and growth in one way or another. Students and teachers were there for one another and grew closer and more interconnected through this experience. We are entering our eighth week of school. Wow! It is hard to believe time is really moving that quickly. We started the year with building schedules, expectations, and routines. We also established norms as we grew closer as a community within each homeroom. Next, we worked on all of our beginning of the year assessments to set baselines as well as gain insight on where to go with individual students. After this it was time for outdoor education. We have since moved into the next sections on our curriculum. Readers’ workshop is a time for learning comprehension strategies one by one and taking time to practice each new strategy in isolation. Students learn each strategy, practice with both picture books and self-selected chapter books, and reflect on their learning as we help them learn which strategies serve to deepen their understanding of text. Making meaning, building fluency, and learning new vocabulary are significant components of our reading curriculum at this time. Writers’ workshop, both instruction and practice, has been a steady building of a part to whole method. We started with lessons on lists, quick writes, and parts of speech. Next, we explored personal narratives and letter writing after our outdoor education week. Now that students have produced a small body of work we will begin our study of editing and revising as we move to publishing a few pieces of finished work for conferences. In math we began with a study, both review and new, of number sense. This includes instruction and work in place value, patterns, skip counting, and early problem solving. Classes are now moving into a study of operations, beginning with addition and subtraction, moving soon into multiplication. We have worked to define the operations (more challenging than you may think!) to build a solid understanding. Students will be using a variety of strategies to solve computation problems. Please ask them to show you how they can think and solve addition and subtraction problems without using the algorithm. Science rotations, when classes move as a homeroom group to a different 3/4 teacher, will begin after conferences. What an exciting time! We have already sent out our proposed conference schedules and have asked for families to either confirm their conference time or request a change. Please do this today if you have not yet done so. Teachers are trying to finalize their schedules for conference days. Conferences at Horizons are a key component to our beliefs and practices of guiding students to become self-directed learners. Teachers prepare for conferences by reviewing student work, reviewing assessments, monitoring growth throughout the year, reflecting on social/emotional learning for each student, and outlining next steps. Students prepare for conferences (following instruction and guidance of teachers) by reviewing their work, preparing work samples to share and present to their parents, writing a letter, reflecting on instruction and follow up work thus far, and thinking about personal goals. As you may imagine, this is a busy time at school. Parents can let us know if there are specific things you would like to talk about, if you have any questions or concerns you want to address, or if you have noticed growth and celebrations to share. At the conference we ask that you listen deeply and be present to all that is being shared, both by your child and by the teacher. We believe that these conferences will leave you both informed and inspired. It is our goal to get you whatever you think you may need to best understand where your child is at this point, what our next steps are, and what our yearlong goals may be for your child. We look forward to sharing this time with you. We are beginning our second week of the first Arts and Science session of the year. All of the classes are movement based classes that offer not only new instruction, but also plenty of exercise. Students were presented with a list and description of all of the classes being offered and then they wrote a list of their top five classes listed in order of preference. All students were placed in one of their top three classes and the first session is off to a great start. Please remind your children to continue to dress appropriately for theses active classes that are held during the last hour of the day. Many of the Arts and Science classes are performing arts classes. Please join us for the Arts and Science Sharing event on Tuesday, October 18, beginning at 2:20 in the gym. You will be able to see performances by the dance class, the circus class, the jump rope class, the karate class, and soccer ball handling skills demonstrated by students in the soccer class. What a celebration it will be! We launched the 2016-2017 Making A Difference (MAD) classes last Friday morning. Making A Difference is a school-wide service learning class. This program was organized similar to the Arts and Science program. Class descriptions were offered to students, students listed their top five choices in order of preference, and a team of teachers worked to sort the class lists so that every student in the school was able to get into a class on their list. MAD classes will be held Friday mornings in October from 10:30-12:30, and then will also meet once a month throughout the year. The students will be learning about a variety of different issues as they learn to become agents of change in their world. Please be sure to continue conversations at home about MAD. The homework that is being assigned Monday, October 10, in class will be part of the conference preparation work that the students will be doing. This assignment will be due back in class on Monday, October 17. Part of the assignment will be for the students to complete independently and part of it will require parents to have a conversation about conferences with their children. The students will be responsible for recording all of the shared thoughts on the homework sheet. Next Homework: Homeroom teachers will be assigning homework to do during the conference week. Even though students are only in class for an hour during the three conference days, they are still school days rather than holidays. We will give reading homework as always as well as additional work to be completed during this time. Lice: We have heard about a few cases of head lice in the ¾ team level. We would ask that all parents carefully check their children’s heads at home for signs of head lice. We know that this is contagious and inconvenient, so we ask that parents do all they can to treat properly at home if needed. Please feel free to call the school office for more information of what to look for and protocols for treating and returning to school. Homeroom teachers will also be aware of this in the classrooms and manage classroom spaces accordingly. Has your kiddo recovered from Outdoor Ed week? We had an absolutely wonderful time together filled with fresh air and an appreciation for nature, learning about our planet and its history, stepping outside our comfort zone and trying something new, and building relationships with one another. From a teacher’s perspective, it was everything I could have hoped for. I have shared a handful of pictures under the “photo tab” on the website. There will be more reflections and writings about Outdoor Ed in the following weeks. Below are a few other updates to be aware of. I have attached a schedule for fall conferences. I tried my best to accommodate the many date and time requests I received and to schedule sibling conferences close together with other teachers. You will notice a few open slots that are still available. If for any reason you are unable to make your assigned time, please email me with an alternative time based on the slots available. More information regarding conferences will be sent your way in the weeks to come. Some families have expressed a desire for an afternoon snack at school, explaining that students come home hungry (or perhaps “hangry”). One of the goals in ¾ is to support students in being responsible and independent in regulating their own eating habits. We have talked about the importance of taking the time to eat lunch and have set goals around lunchtime eating, but students are still bound to leave school with a grumbling tummy. That being said, I told students that I was OK if they wanted to eat any leftover food from lunch during the final recess of the day. We do not have the time to set aside an afternoon snack time as a group and I do not feel it’s appropriate to ask families to provide both a morning and afternoon snack. However, if there is uneaten food in a lunchbox, students can finish these snacks during the final recess. Additionally, the decision was made by Horizons faculty to request that any Pokemon cards or card trading of any sort be removed from the school day and recesses. Rather, it is a weekend activity to look forward to. I have had a conversations with the kids about this and ask that you please support your child in leaving any trading cards at home. Tomorrow we begin our first A&S session. All of the offered classes are movement based and taught by experts in the field (circus, soccer, Skip-Its, tennis, basketball, etc.). This course will take place during the last hour the day, Monday through Thursday for the next two weeks. Please remind your child that activewear is requested every day, including tennis shoes. If a student requires shin guards or other specific gear, students will be made aware of the request after their first class on Monday. Unless there is an extreme change in the weather, many of these classes will be offered outside, rain or shine. A warm layer or rain coat is recommended. As a final request, if anyone is interested in donating a floor lamp or two for the classroom, I would love to keep the flourescent lights off during the day and use lamp light instead. Please send me a message if you can donate such an item. Homework will go home with students on Monday. Make sure to take a peek at it and support your kid when needed. Thanks in advance! Happy Sunday to all! I hope you are enjoying the crisp fall weather this weekend. Students will need a sack lunch and snacks on Monday, Tuesday, and Thursday. Camp Timberline will provide dinner on Tuesday and breakfast and lunch on Wednesday. Students should be wearing appropriate active shoe-wear and clothing all week. We will be hiking at Dinosaur Ridge tomorrow so tennis shoes are a must. Students should bring their day bag to school tomorrow packed with sunscreen, sunhat, full water, lunch, snack, and rain jacket. On Tuesday, there will be a marked space in front of the school’s front doors for students to put their overnight bags when they arrive at school. Only their day bags should come into the classroom with them that morning. Please let me know if any questions arise as your kiddo prepares for the week. We’re looking forward to a great Outdoor Education Week. Thanks for all the parent support. The teachers in all four homeroom classes have been working on assessments for the last couple of weeks. Many district schools begin the year with assessments. We took time first to build community, get to know one another, and establish routines. We are now completing the last of our assessments and beginning to use the results we have found to inform our instruction and guide our planning for the fall. All four of the classes have begun the year with book clubs, either whole group or small group. Hopefully you have already been hearing about what your child has been reading. By sharing reading we are able to close read in different ways as well as dig into our comprehension work. The beginning of the year math instruction and practice has included a study of number sense including place value, base 10 systems, patterns, skip counting, and having the students show their thinking. Instruction often includes a short whole group lesson followed by a variety of games and practice problems. The students have begun creating a body of writing that we will later be able to use as we learn more about editing, revising, and structuring both sentences and paragraphs. Students have been working on quick writes, seed lists, and exploring parts of speech. In science we have introduced the story of the universe through timelines and images. We are working with the skill of scientific observation. Classes are beginning the first homework assignments of the year. Some of the teachers have sent work home already and others are beginning to teach and learn homework habits in the classroom first. This is teacher dependent, as determined by the needs in each class. Homework in all classes will begin in earnest and keep a regular schedule after our outdoor education week. Thank you all for joining us at our annual Back to School Night presentation. It is our hope that you found both the information and the inspiration that you needed. Please be sure to talk with your child’s homeroom teacher if you find yourself with lingering questions or uncertainties about our goals for the year. We are very excited for our upcoming outdoor education week. Please be aware that our schedule is different from that of the other grade level teams. A couple of years ago we reconfigured the grade level structure at Horizons. When that happened, our team lost the venue that we had been using for outdoor education. Since that time we have been in search of another location and program for students at our grade level. Ideally our trip would be two nights and three days. We love our overnight at Camp Timberline. The second day has been extended. Our return time to Horizons is scheduled for 4:00 on Wednesday, September 28. Since we are not able to travel for our ideal length of time, we have instead opted to develop an outdoor education week for the students, with an overnight trip for two days and two local day trips. Outdoor education packets and payment should be completed and returned to your child’s homeroom teacher immediately. Parent volunteer offers should also be submitted to homeroom teachers. We will review our volunteer list this week and let parents know how they can best meet the needs of our team during outdoor education week. All medications to be administered to students during our overnight trip need to be delivered to Kate by Wednesday, September 21. All medication, including over the counter and herbal supplements, must be in their original packaging and accompanied by a doctor’s orders. Please be sure to ask if you have any questions about this. Students will need to bring their own lunch from home (our schedule will not work with the hot lunch program) during outdoor education week on Monday, Tuesday, and Thursday. Camp Timberline will be providing lunch on Wednesday. We recommend a hearty lunch as students often work up an appetite on outings. Disposable containers and lunch bags are easiest on field trip days. In reader’s workshop, we are in the midst of a whole-class book club of Roald Dahl’s The Witches. We’re totally hooked on Dahl’s storytelling talents and thirst to read more every day. Sometimes I read aloud as the students follow along in their book, sometimes we break into small groups and students take turns reading to the group, and other times we read in pairs, modelling fluency with on another. In an effort to set up a true reader’s workshop structure, students then have time to respond to the reading in a variety of ways: drawing a picture of the setting, rewriting the end of a chapter, describing a character in depth, exploring and using new vocabulary from the text, making a timeline that shows the sequence of major events in the story, and more. Throughout this workshop model, we ask the essential question: how do we understand what we read? Responding to text on a daily basis allows us to practice a variety of comprehension strategies and set up strong reading habits. Students continue to build reading habits and stamina during silent reading time. We have reviewed how to pick a just-right text and students do so independently and with my support. Students should also be reading at home every night and I encourage them to read out loud to someone to continue working on fluency and expression. We are also working on building fluency and stamina in our writer’s workshop. We have written a variety of seedlists that we can refer back to for writing ideas in the future. We have also discussed how writer’s plan before they begin writing and practiced making a plan in our head before we write. We walked to the pond one-day last week and wrote five senses poems about an emotion. Some powerful images and descriptions were produced during this time. We will continue to write seedlists and begin some quick writes to get the creative juices flowing in the week to come. This writing will be paired with some word work instruction on verb tenses and endings, paying particular attention to the –ed past-tense ending. In math, we’ve asked ourselves: how does our base-ten system work? We’ve defined digit, value, and place value and we’ve been working to understand numbers up to one million. Writing numbers in expanded form has been valuable in understanding the value of a digit in a certain place value and making connections to the quantity a digit represents. We will continue our exploration of the base-ten system with further practice with expanded form; using base-10 blocks to represent, compare, and order numbers; recognizing differences of 1 or higher powers of 10; and identifying and continuing patterns that increase or decrease by powers of 10. Additionally, we will continue solving puzzles and finding the patterns in a variety of number sequences, supporting our overall number sense, and playing math games that support our fluency in making ten, place value, and addition and subtraction. We’ve been busy and we’ve already learned so much! We’ve also been building our community. Once a week, we have a community meeting that’s student led. It’s a time to pause and reflect on what’s happening at school and to check-in with one another about celebrations, concerns and problems, and thank yous and apologies. During our community meeting this past week, students shared that friendships are going well at school. They felt that everyone was getting along, reconnecting with old friends while also getting to know new faces and making new connections. We agreed that while this is wonderful, we can continue to work on reaching out to others, inviting peers to play, and trying out new games and recess activities. This will continue to be a class goals as we move forward into September. This past week we also built our agreements together. We made a huge list of ideas and then talked about ways to narrow down the list to the most important agreements we want to strive for every day this year. I was struck by how profound the thinking was during this time. In the end, we decided our agreements are (1) Be accepting of one another’s differences and stand up for one another; (2) Keep your work space clean and organized; (3) Try your best and learn from your mistakes; (4) Be aware of how your body moves through space. I encourage you to continue the conversation at home about these agreements and to support and celebrate your child’s practice of them at school and at home. Thanks for sharing your children with me. It has been a joy to get to know them and to launch our learning for the year. Feel free to contact me whenever the need arises. Everyone said they were excited to come back tomorrow. It was touching to watch the transformation of feelings throughout the day, too: shy, nervous, and worried when entering the classroom to confident and curious at dismissal. It's important to, however, that many kids keep it together through out the school day and then hit a wall when they get home. Please show kindness and patience as we build stamina over the first few weeks of school. Lots of sleep is a must! Please help your child remember to bring in 2-3 items that represent them tomorrow. We will use these tomorrow and into next week. If your child has any health concerns or allergies for me to be aware of, please send me an email. Food allergies are especially pertinent as birthday celebrations will start next week. A reminder to bring a snack from home every day. Please have this in a separate bag/container than their lunch. ​I will post classroom policies and other information in the next couple days. Please keep an eye out. Cheers to the first day!